The Path of Exile: Incursion league was recently announced and this trailer has me pumped! 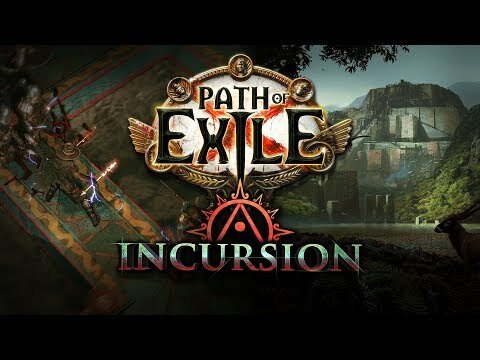 As a regular player, Path of Exile: Incursion seems to have one of the best concepts that could integrate into the main game easily without much interruption. This trailer showcases a temple that players can manipulate by upgrading and connecting rooms for loot. This is a repeatable process up to eleven times (as of the trailer), and at the end of the building and manipulation stage players run the final version for a lot of different loot. The trailer does a great job of explaining what the league does, which the Beastiary league trailer failed to do. Path of Exile: Incursion league also looks like the most finished and ready to go than previous leagues. What we also see in the trailer is at the end of a temple run the loot pops out like confetti, so players don’t need to spend time picking up loot. The reason for that is during the building phase of the temple there are timers, so clear speed is especially important and also connecting rooms to get to the final boss. I’ve never been this pumped for a league mechanic before and I hope Path of Exile: Incursion doesn’t disappoint.